Asthma is a debilitating chronic lung disease affecting over three million CanadiansFootnote 1. When inhaled corticosteroid (ICS) monotherapy is unable to maintain control over symptoms, a combination of ICS and a long-acting beta-agonist (LABA) is recommended for patients aged 12 and olderFootnote 2. This analysis examines Canadian and international markets for the four ICS/LABA combination asthma inhalers available in Canada: fluticasone/salmeterol (Advair); budesonide/formoterol (Symbicort); mometasone/formoterol (Zenhale); and fluticasone/vilanterol (Breo Ellipta). This therapeutic class was selected for study as it has relatively high domestic sales combined with one of the highest price differentials between Canadian and median international levels. International markets examined include the Organisation for Economic Co-operation and Development (OECD) members, with a focus on the seven countries the PMPRB considers in reviewing the prices of patented medicines (PMPRB7): France, Germany, Italy, Sweden, Switzerland, the United Kingdom (UK), and the United States (US). These preliminary findings will form the basis of a more comprehensive study as part of the PMPRB’s Market Intelligence Report series, which provides detailed information on specific therapeutic market segments of importance to Canadians to inform policy discussions and support evidence-based decision making. With over half a billion dollars in sales in 2017, combination asthma inhalers accounted for 42.8% of the total sales for obstructive airway disease medicines, and 2.3% of the Canadian prescription pharmaceutical market. Advair, the earliest entrant in this class, still accounts for almost half of the market, although its share has decreased in recent years as newer entries Zenhale and Breo Ellipta continue to grow. Average annual treatment costs were higher in public plans than in comparable private plans, most notably for Advair. An analysis of the demographic and utilization factors influencing treatment costs will be presented in the final published report. This bar graph and accompanying table give the Canadian sales and average treatment costs for combination asthma inhalers in 2017. The bar graph illustrates the percentage of the $561 million in total national sales attributable to each of the four combination asthma inhalers available in Canada: Advair – 48%; Symbicort – 37%; Zenhale – 6%; and Breo Ellipta – 8%. The table gives the corresponding average annual treatment cost per beneficiary in NPDUIS public plans for all provinces and Yukon, excluding Quebec, and private plans, nationally. Per capita ex-factory sales of combination asthma inhalers in Canada were second highest in the OECD after the US. While consumption per capita in Canada is estimated to be higher than the OECD median, numerous other countries with similar or higher estimated consumption rates, such as the UK, have lower per capita spending. 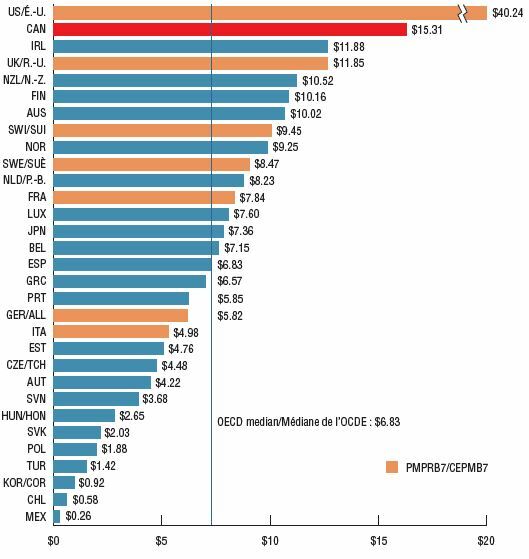 Of note, Canada, Switzerland, and Japan were the only OECD countries without any generic products on the market. The variation in sales per capita internationally may be due to a number of factors including different rates of consumption and price differentials. This bar graph gives the 2017 sales per capita in Canadian dollars for each country in the Organisation for Economic Co-operation and Development (OECD). The OECD median sales per capita was $6.83. Canadian prices for the top-selling strengths of each combination inhaler were higher than the corresponding prices in all PMPRB7 comparator countries except the US in the fourth quarter (Q4) of 2017. 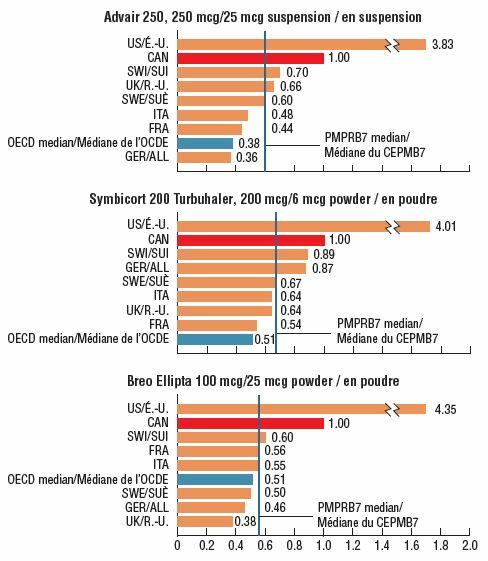 PMPRB7 median prices for the leading strengths of Advair, Symbicort, and Breo Ellipta were between 33% and 45% lower than the prices in Canada, while the respective OECD medians were nearly half the Canadian levels. * Price comparisons for the other available ICS/LABA strengths produced similar results – compared with the PMPRB7 countries, the median foreign-to-Canadian price ratio for this therapeutic class was 0.55. This figure consists of three bar graphs depicting the foreign-to-Canadian price ratios for the top-selling strengths of Advair, Symbicort, and Breo Ellipta. Bilateral price ratios are given for each of the seven PMPRB comparator countries, as well as median price ratios for the Organisation for Economic Co-operation and Development and PMPRB7. Zenhale was not reported due to the lack of comprehensive data, as only US and Canadian prices were available (the foreign-to Canadian price ratio was 3.05). * Q4-2017 pricing information for Zenhale was only available in Canada and the US, with a foreign-to-Canadian price ratio of 3.05. The price differentials between Canadian and international markets may translate into substantial cost implications for domestic payers. 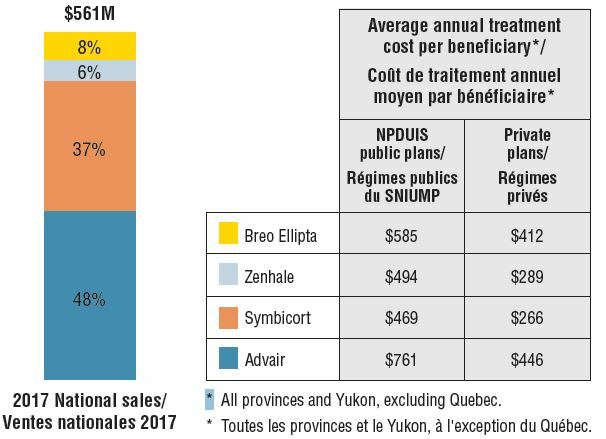 If Canadian prices for each strength of Advair, Symbicort, and Breo Ellipta were aligned with the PMPRB7 median price levels for Q4-2017, national Canadian sales for these drugs could have been up to $225 million lower in 2017, including $102 million in cost implications for NPDUIS public plans. None of the values reported capture off-invoice price rebates, managed entry agreements (also known as product listing agreements), or patient access schemes. Thus, the price differentials and cost implications presented here may be overestimated or underestimated depending on the actual rebated prices in Canadian and foreign markets. Note: Cost implications for Zenhale were not included in the calculation, as there was insufficient data for a PMPRB7 median price. Public Health Agency of Canada. 2018. Report from the Canadian Chronic Disease Surveillance System: Asthma and Chronic Obstructive Pulmonary Disease (COPD) in Canada, 2018. Canadian Thoracic Society. 2012. Canadian Thoracic Society 2012 guideline update: Diagnosis and management of asthma in preschoolers, children and adults. Availability, uptake, and pricing information - IQVIA MIDAS™ database (all rights reserved). Private drug plan data - IQVIA Private Drug Plan database. Public drug plan data - NPDUIS Database, Canadian Institute for Health Information (CIHI). Population data - World Bank. Canadian and international sales and list prices available in the IQVIA MIDAS™ database are estimated manufacturer factory-gate list prices and do not reflect off-invoice price rebates and allowances, managed entry agreements, or patient access schemes. Although this information is based in part on data obtained from the NPDUIS Database of the Canadian Institute for Health Information (CIHI) and under license from IQVIA’s MIDAS™ Database and Private Drug Plan database, the statements, findings, conclusions, views, and opinions expressed in this study are exclusively those of the PMPRB and are not attributable to CIHI or IQVIA.